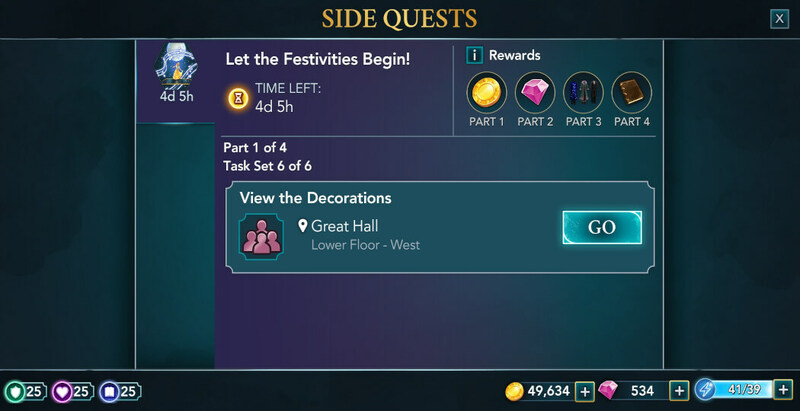 Hello everyone, welcome to the Walkthrough for Part One of Let The Festivities Begin Adventure for Harry Potter: Hogwarts Mystery. 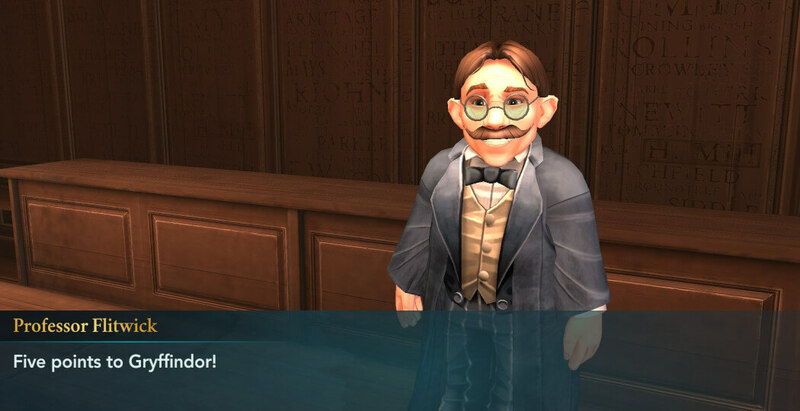 This adventure is available for students of Year Four and above. This one is by far the longest adventure released up to this date. 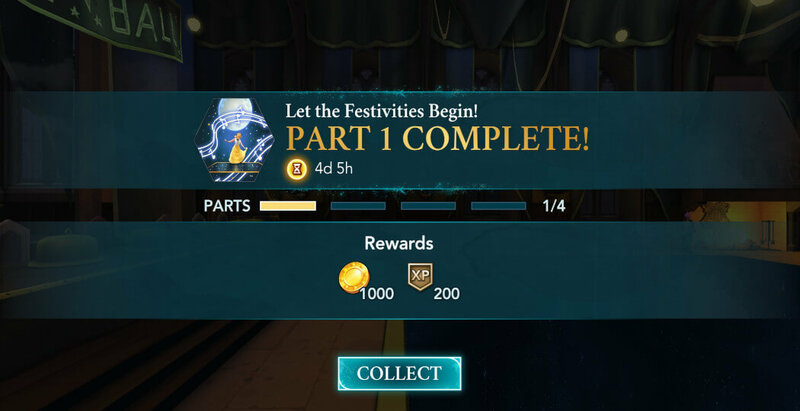 Thankfully, you have 4 days and 17 hours to complete it, which should be enough time to finish all four parts. 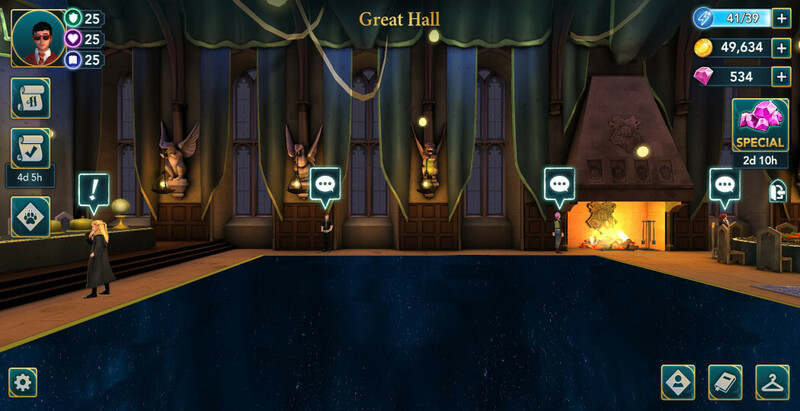 Once you start the adventure, head to the Great Hall to meet your friends. 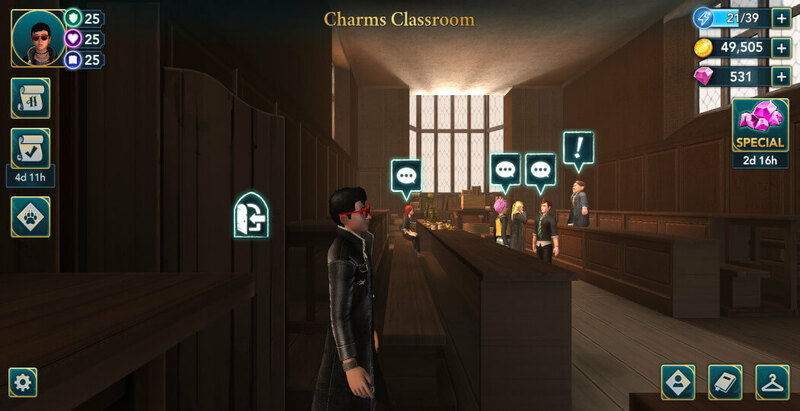 Upon arriving, you can interact with some of your classmates by tapping on the speech bubbles above them. 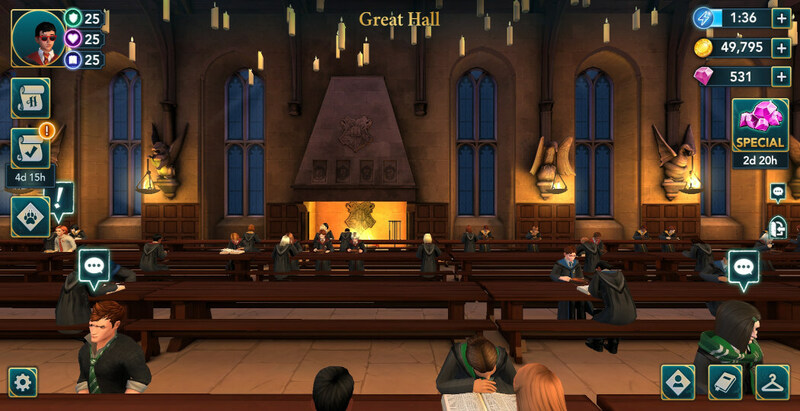 Dumbledore will then reveal the reason for summoning students to the Great Hall. 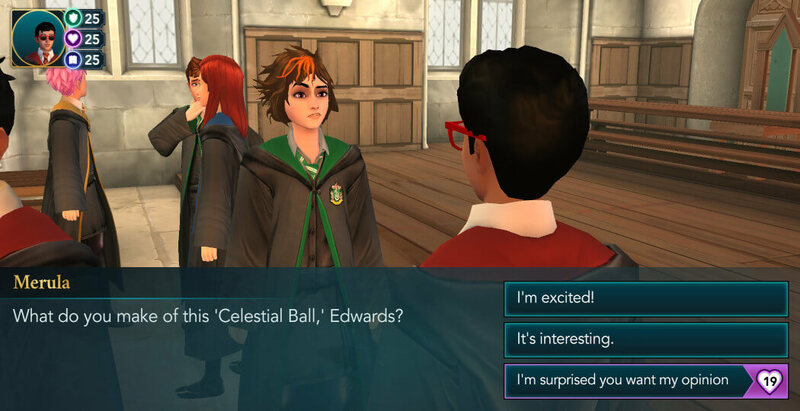 Shortly after the Headmaster finishes his speech, Merula will approach and ask of your opinion regarding the Celestial Ball. 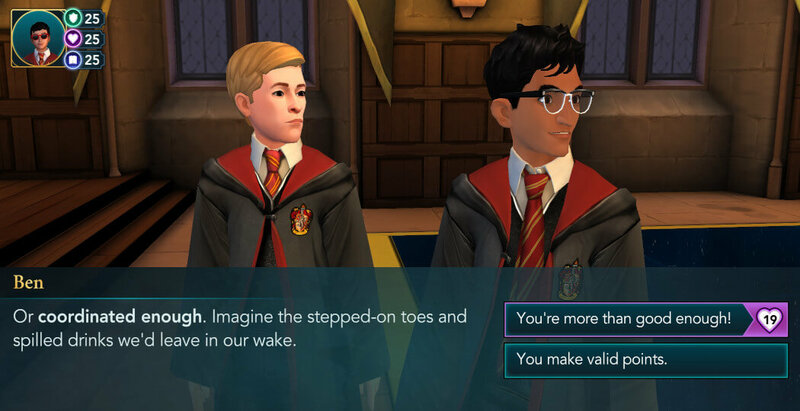 You have three response options. All of them will lead to a pretty much same outcome, so feel free to pick the one you prefer. 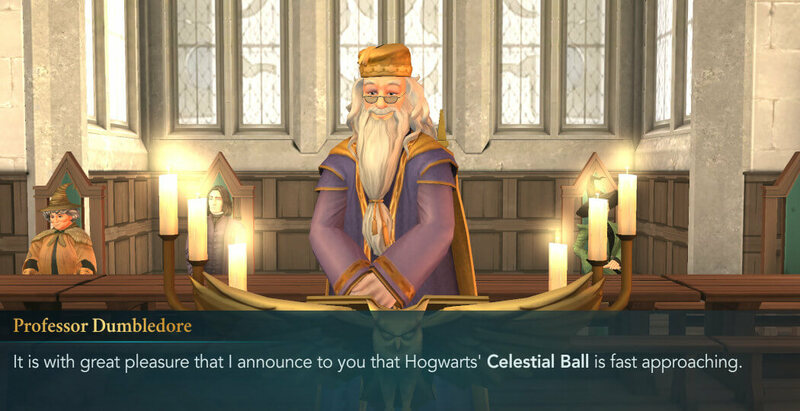 Afterward, you’ll get to discuss the Celestial Ball with your friends. 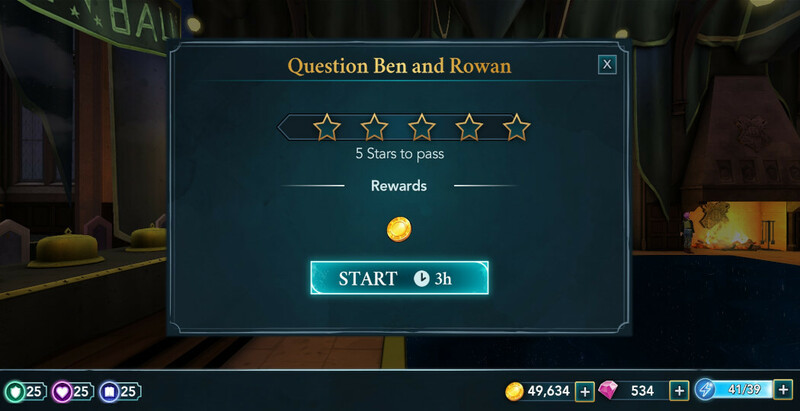 You have one hour to complete it and earn at least one out of five stars to pass. Completing the entire task will take around thirty energy. 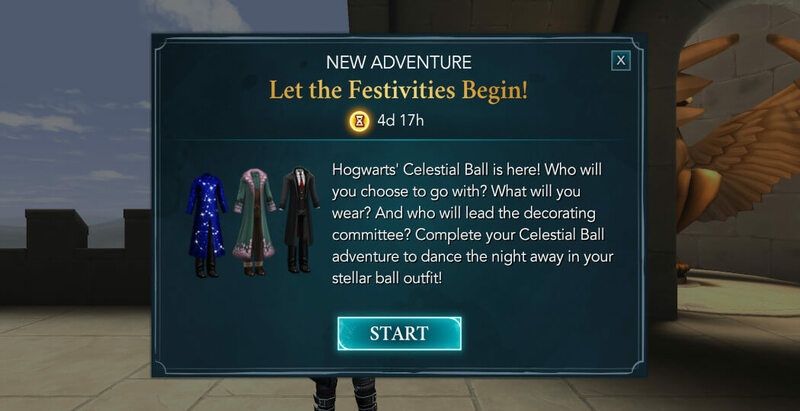 However, since the adventure is time-limited, you might want to consider earning a couple of stars and letting the timer expire. This will save you around fifteen energy or so, which could help you in the long run. 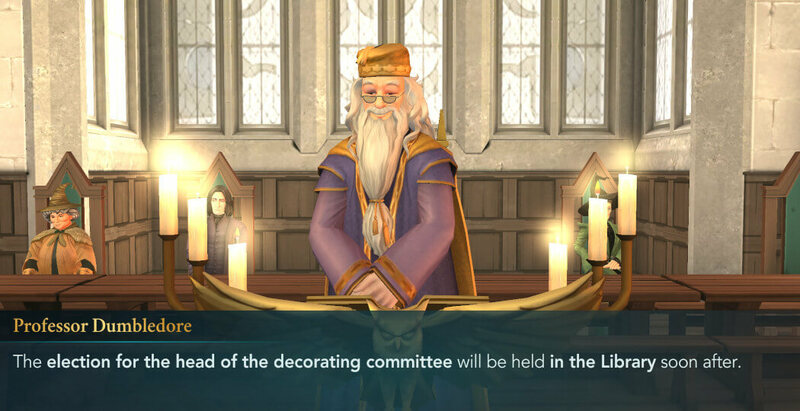 When you are done with the task, Dumbledore will make one more announcement before dismissing all the students. 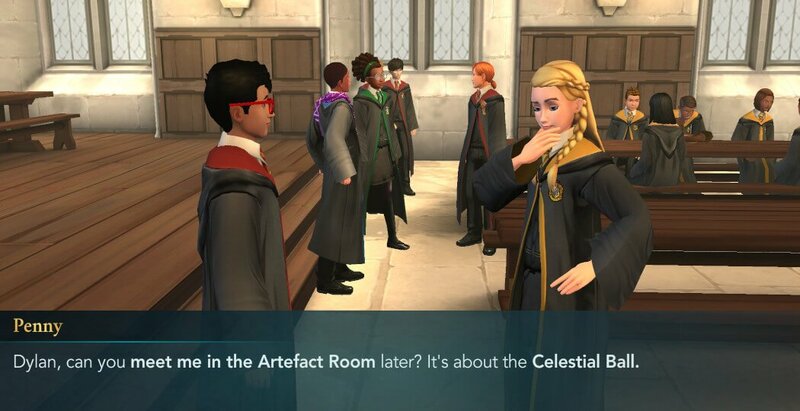 Penny will then ask you to meet her in the Artefact Room to discuss something related to the Celestial Ball. Once you are ready, hit the GO button and proceed there to meet her. As you arrive, she’ll ask if you’d be willing to join the Celestial Ball decorating committee. She’ll then ask if you hoped to talk about something else. 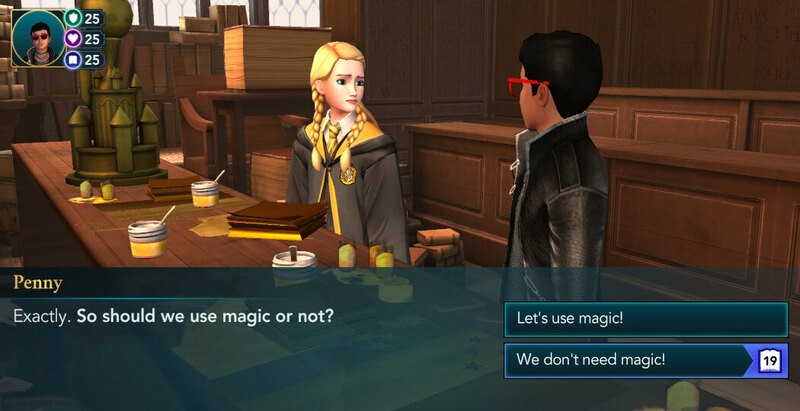 You have two response options. There are some minor differences, but in general, they both lead to the same outcome, so you can freely pick either of those. She’ll then tell you that Emily Tyler plans to lead the decorating committee. Shortly after, Penny will explain everything about the election to you. 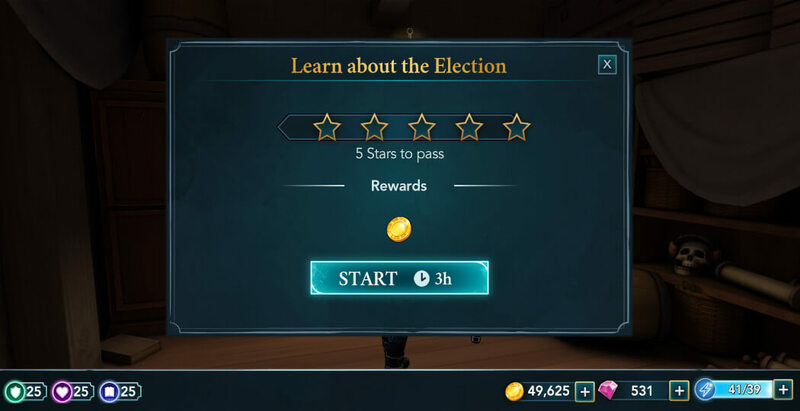 This is a task which requires you to earn five stars within three hours. All of the stars are needed to pass, so you should avoid starting it with an empty energy bar. 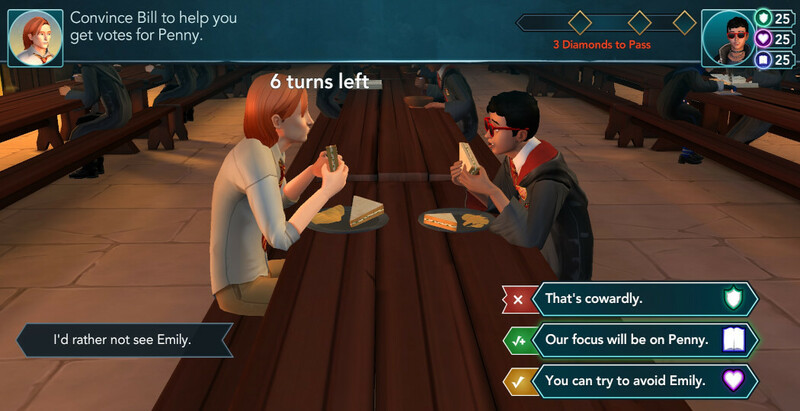 You’ll need around 55-60 energy to complete this task, depending on the actions you do. 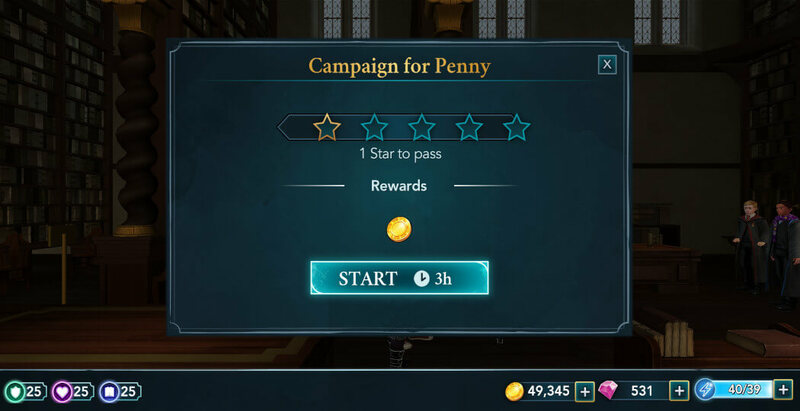 When you complete the task, you’ll come up with a plan to promote Penny to other students. 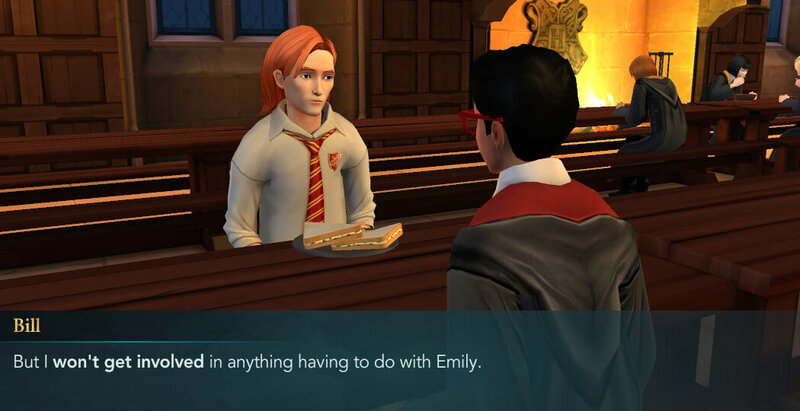 However, in order to do that, you’ll need help from none other than Bill Weasley. 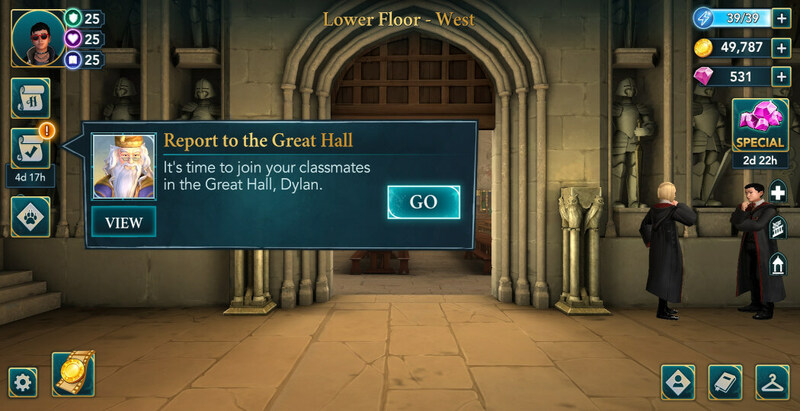 Proceed to the Great Hall to meet him. 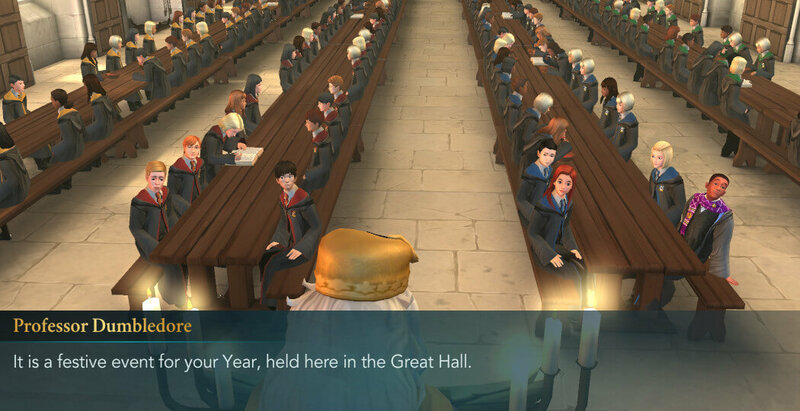 As usual, you can tap on the speech bubbles above some of your classmates if you are interested to see what they have to say. Once you reveal your plan to Bill, he’ll be fairly reluctant to help, so you’ll need to do some convincing. 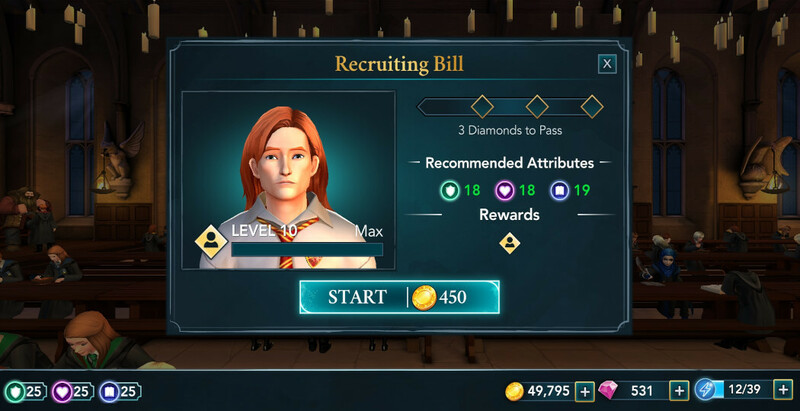 The task window will display the recommended attribute levels and the gold cost. This plays out quite similarly to Meal With a Friend. 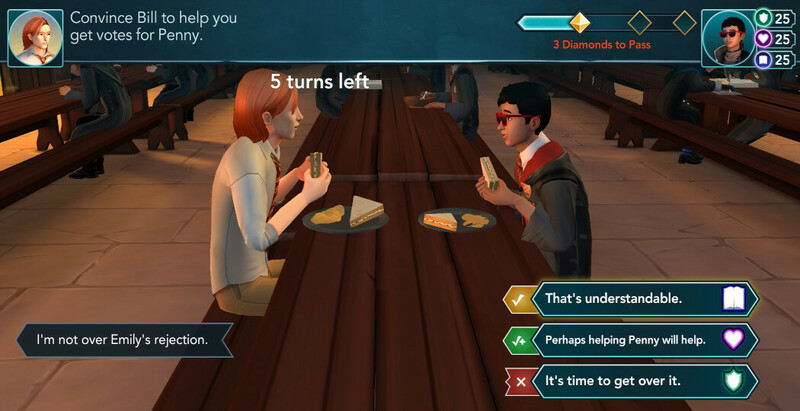 The attribute requirements are fairly low, so you shouldn’t have any issues with completing this task in six turns. Below are some of the questions and answers to them. 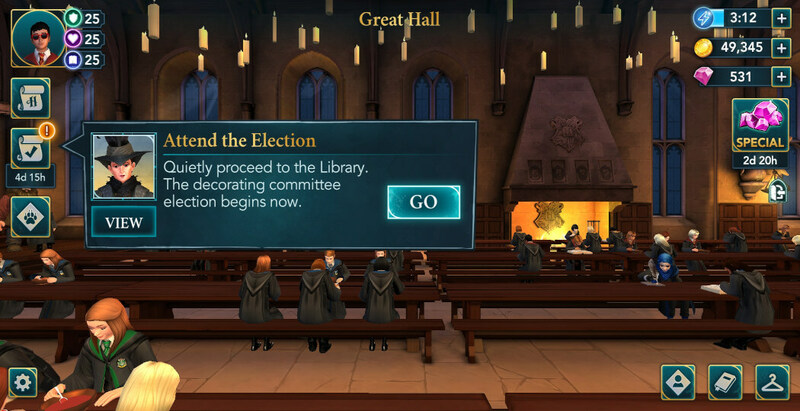 Once you are done, head to the Library to attend the election. 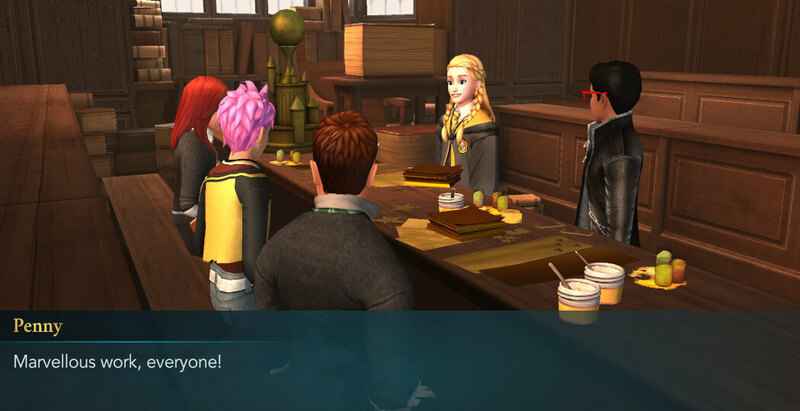 Upon arriving, you’ll notice the speech bubbles above some of the characters. Tap on those to see what they have to say to you. 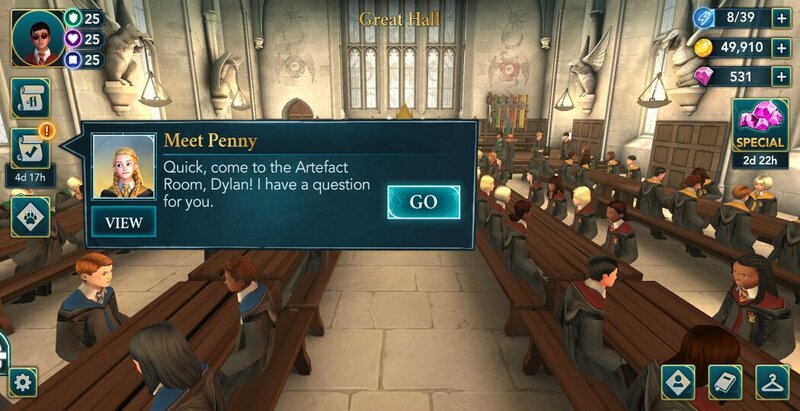 Shortly after, you’ll get the task to campaign for Penny. To complete it, you need to obtain five stars within three hours. 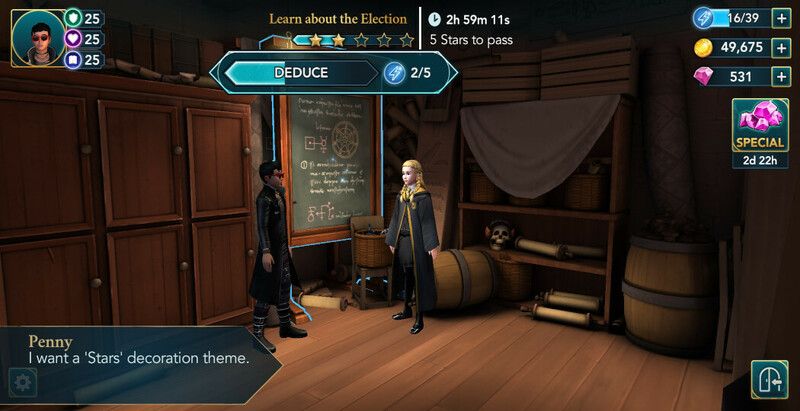 If you want to save some energy, you can earn a few stars and then wait for the timer to expire. 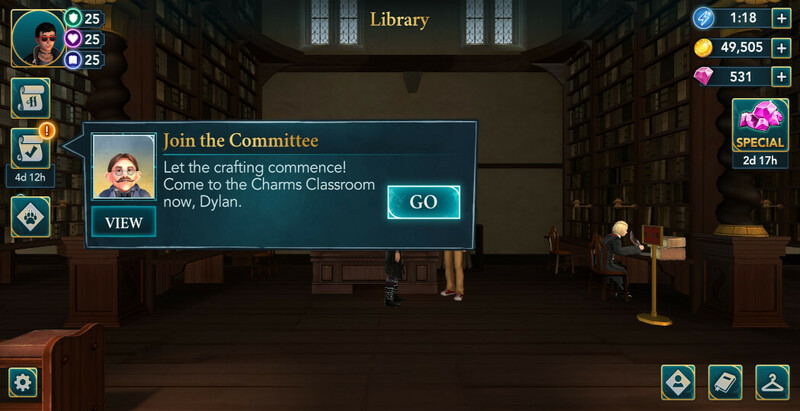 This way, you’ll save around 20 energy, which could make a difference since the timer for the adventure is limited. 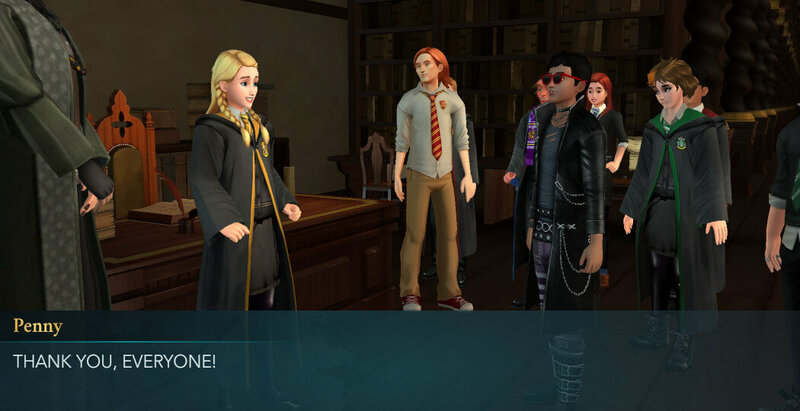 Either way, when you are done, Madam Pince will announce the winner of the election – Penny Haywood! 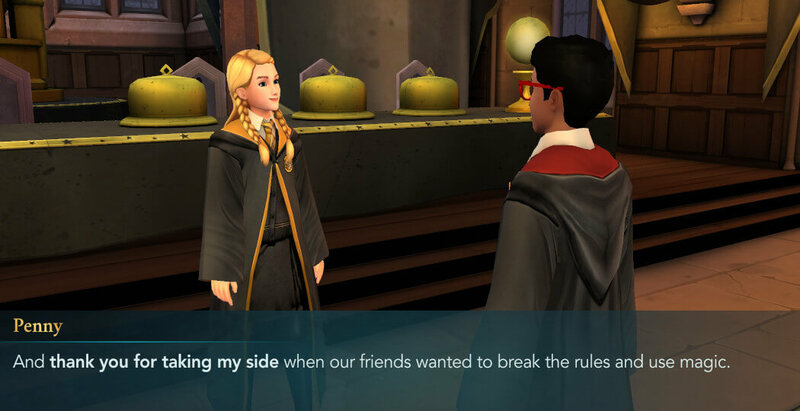 You’ll then thank Bill for being kind enough to support Penny. 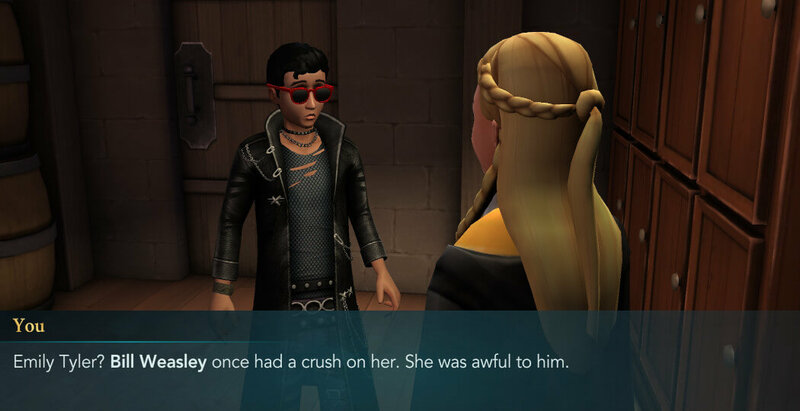 He’ll ask if you consider her more than a friend. You have two options to choose from. 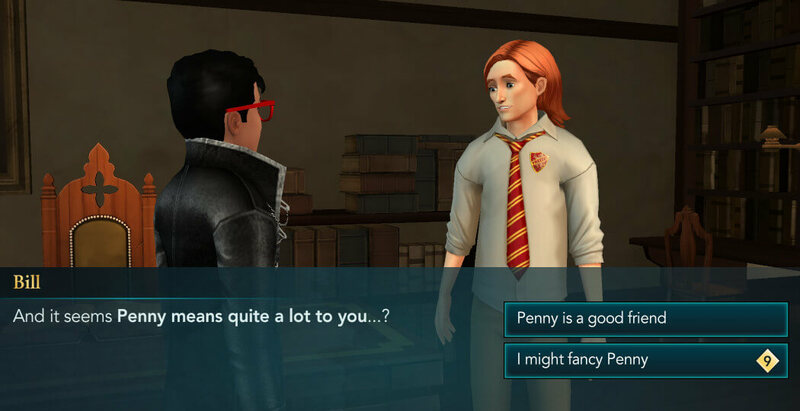 Bear in mind that this choice may have an effect on the future romance with Penny, so if you like her, it is highly recommended to pick the second option. 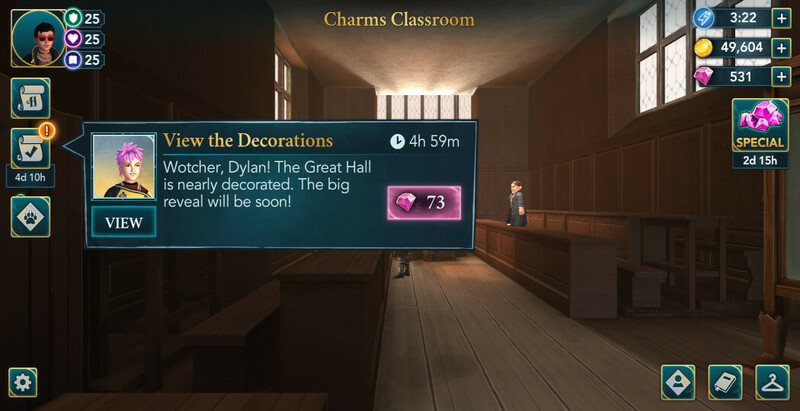 For the next task, you should proceed to the Charms Classroom. 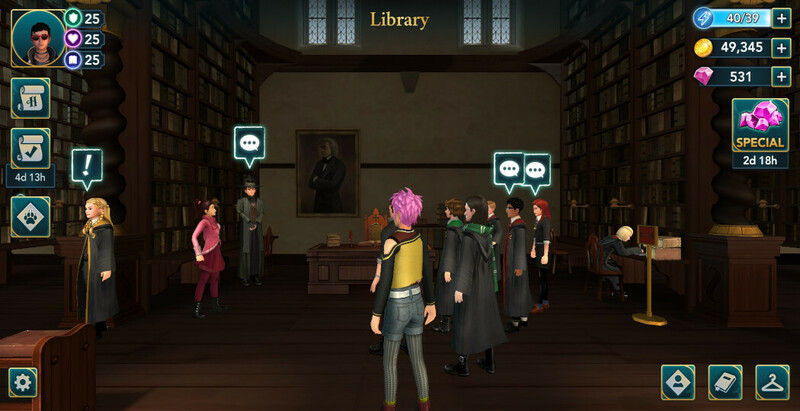 When you arrive, you can tap on the speech bubbles above your friends to see what they have to say. 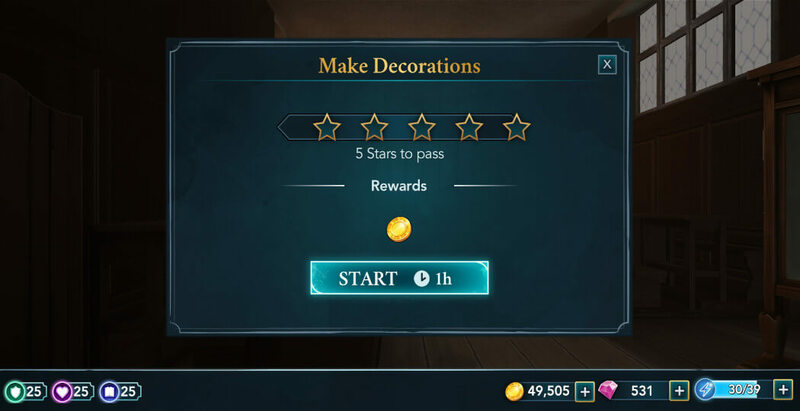 Professor Flitwick will warn you not to use any magic when creating the decorations for the ball. Exactly that is your next task. To complete it, you need to acquire five stars within an hour. All of the stars are required to pass. 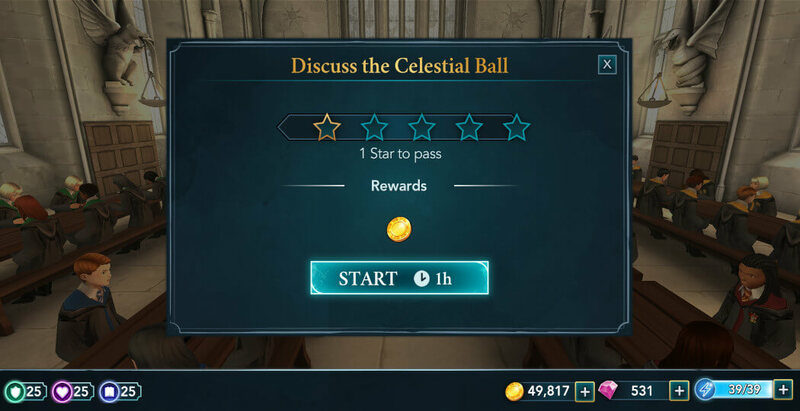 You’ll need between 30 and 35 energy to obtain all the stars, which should easily be achievable with a single energy bar. 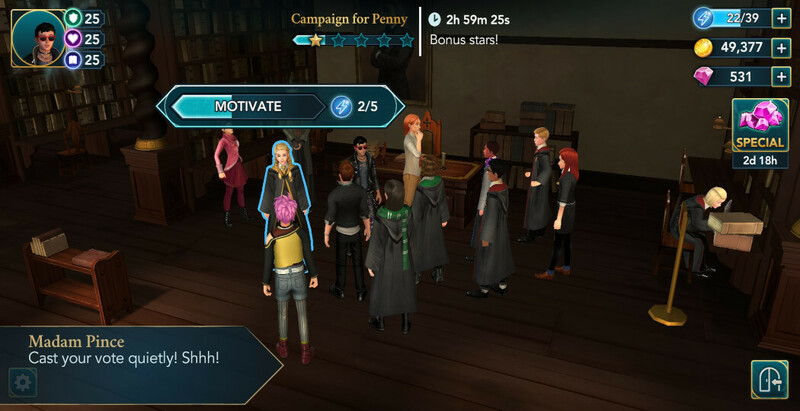 When you are done, Penny will praise everyone for their effort. 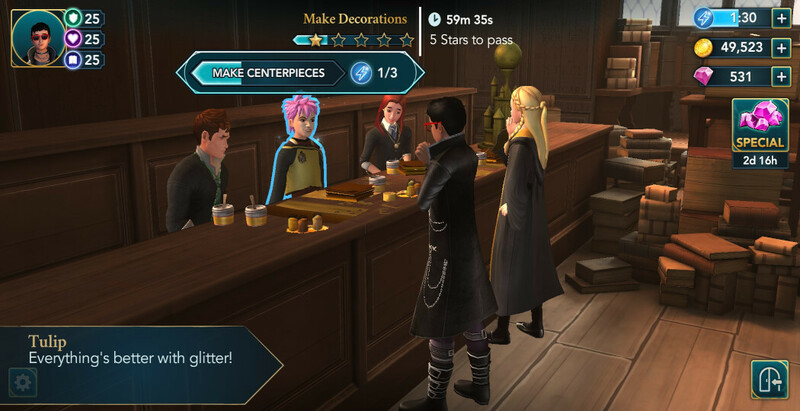 Tulip will then suggest using magic to make the decorations better. You’ll get the option to do so if you want. 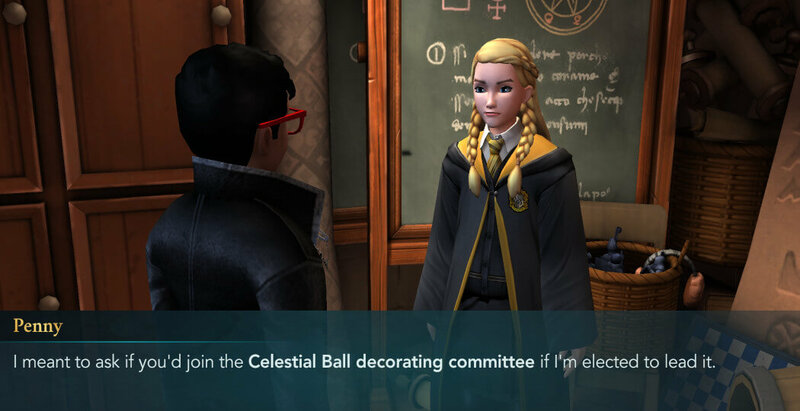 However, if you use magic, Penny will get removed from the decorating committee, so you definitely want to avoid that. Because of that, it is highly recommended to pick the second option. 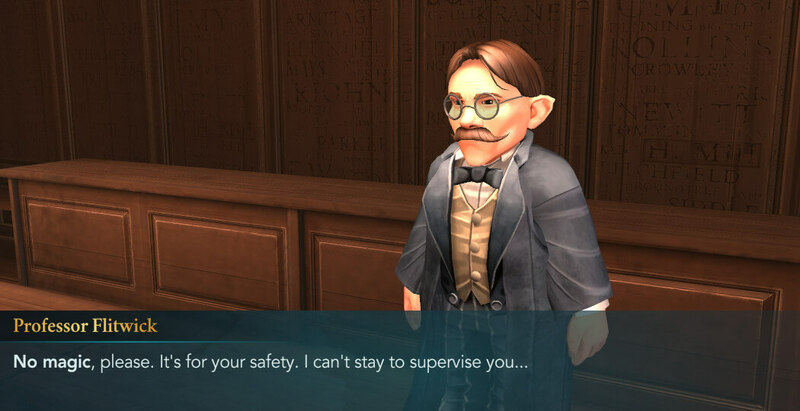 Also, if you decide not to use magic, Professor Flitwick will reward you five House Points. Before you can proceed, there is a waiting period of five hours. 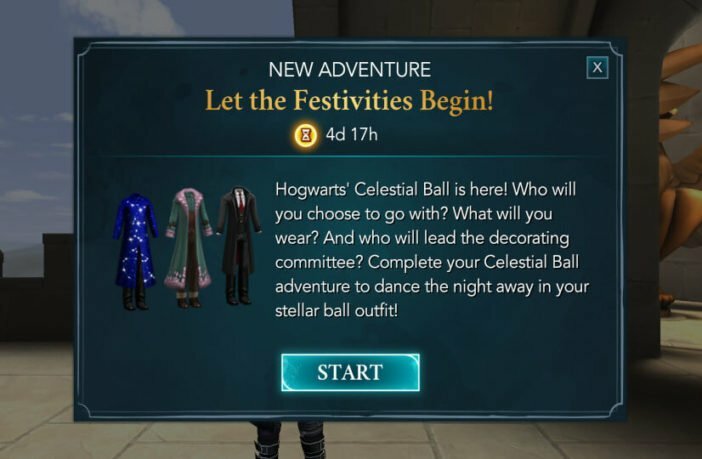 If your remaining time on the adventure is greater than 4 days, you should probably wait for the timer expire. If you have less than 4 days remaining, you might want to consider spending gems to remove the waiting time. 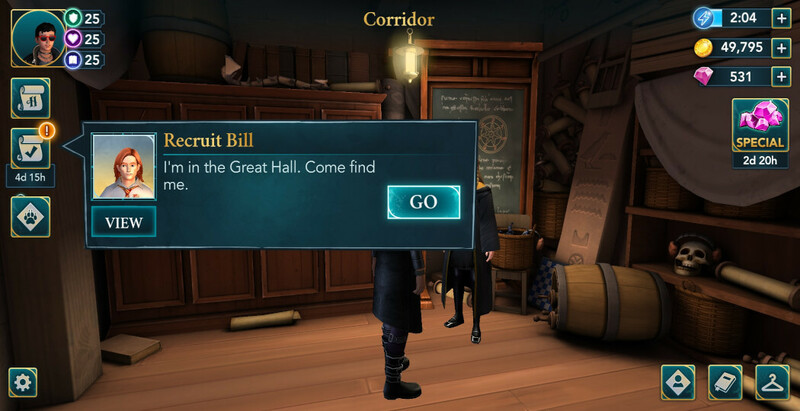 Either way, head to the Great Hall once you are able to continue. 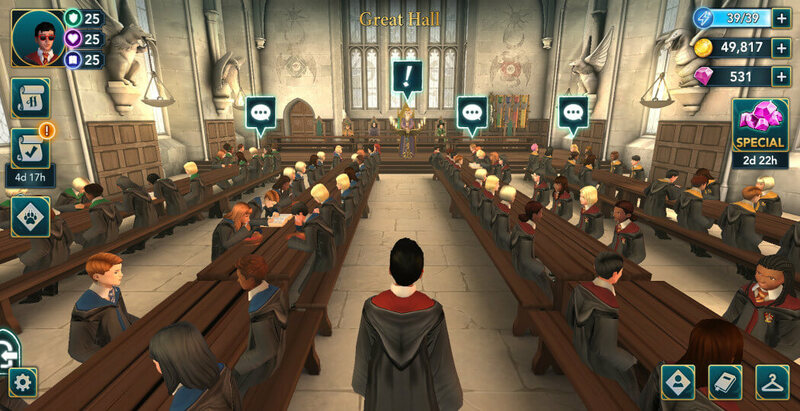 As you arrive, you’ll notice the speech bubbles above some of your classmates. Tap on those to see what they have to say to you. 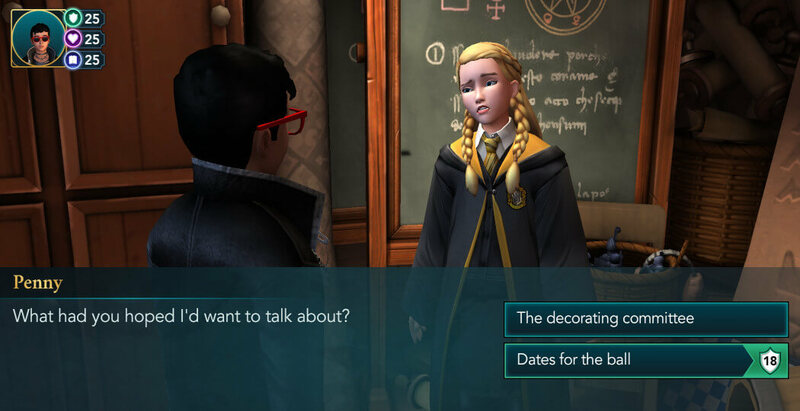 Penny will thank you in case you decided not to use magic for decorations, otherwise, she’ll be quite down. 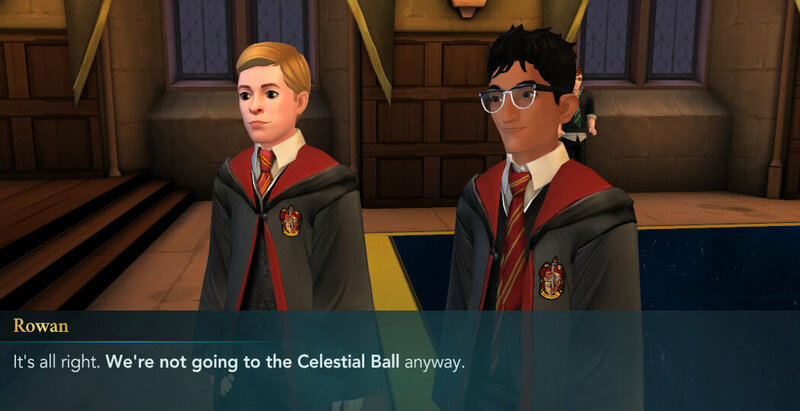 Ben and Rowan will then show up and say they decided not to attend the Celestial Ball. You’ll get to ask them about it. This is your next task. 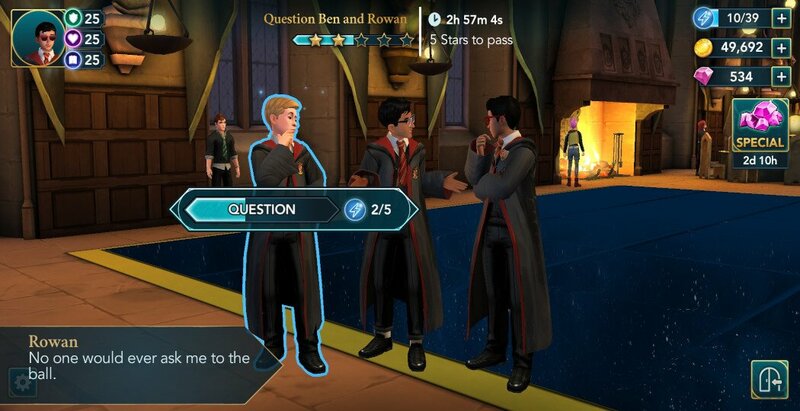 You need to earn five stars within three hours to complete it. 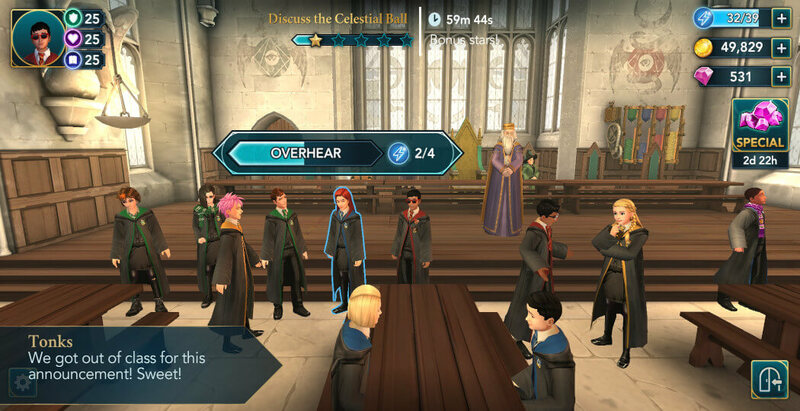 There should be a fair number of 5 cost actions available for this task, so you should be able to finish it with about 55 energy or so. After you’re done, you’ll find out why they don’t want to go to the ball. You have two options to respond with. Each will lead to the same outcome, so feel free to pick the one you prefer. Shortly after, Part One of the adventure will come to an end. Hit the Collect button to claim your rewards. One down, three to go. 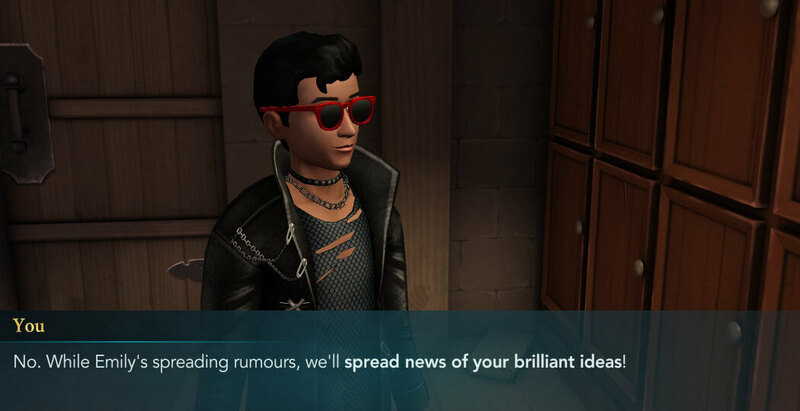 Now that you’re done with the decorations, you can try to convince Ben and Rowan to attend the ball and have a good time. But will you be able to persuade them to change their mind? 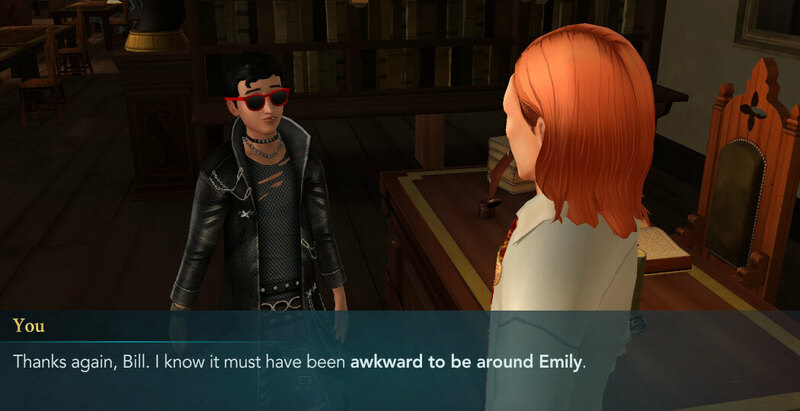 Find out in the next part of this lovely adventure.